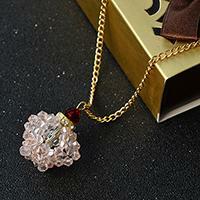 Are you searching for flower pendant necklace? 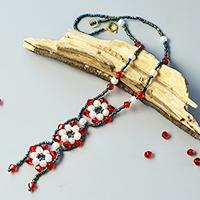 This tutorial will show you a beaded flower necklace, hope you will like it. 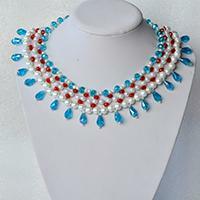 In this Pandahall original DIY project, I want to show you how to make a three-strand blue beaded necklace with glass beads, pearl beads and turquoise beads. 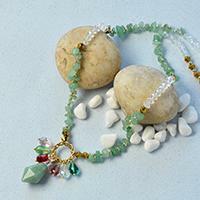 Hope you like the three-strand necklace. This Pandahall tutorial will show you how to make a red and clear glass beaded collar necklace step by step. 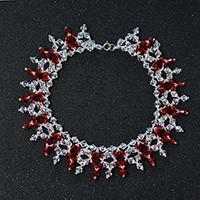 Hope you like this red and clear glass beaded necklace. 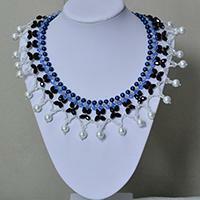 Check this Pandahall free tutorial if you are in need of a bling statement necklace for parties. 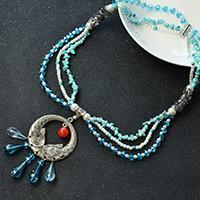 In this Pandahall tutorial, you can learn how to make a bling handmade blue glass bead necklace. 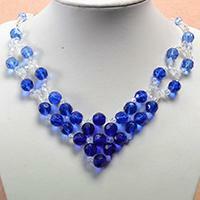 Hope you like the blue glass bead necklace and enjoy the DIY process. Do you want to make your unique jewelry for the beach in summer days? Follow me to check this tutorial on making ocean inspired statement necklace here! By adding some drops, you can also diy this beaded choker necklace easily! Are you curious? Check the steps below! 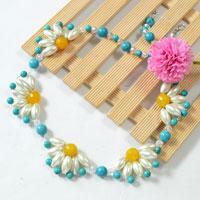 In this article, you can see a handmade colored acrylic bead necklace. The detailed tutorial below will show you how to make this colored acrylic bead necklace with cord braided bead pendant. 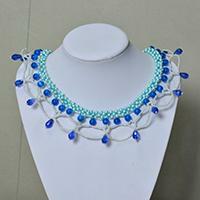 This is an ocean inspired glass and pearl beaded collar necklace making tutorial. Hope you enjoy it and have a try. 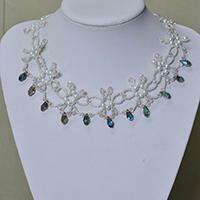 Searching for handmade collar necklace designs? 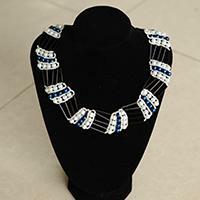 This blue and black collar necklace may be a good choice for you. 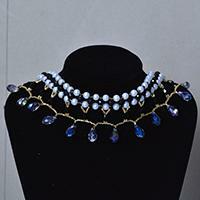 Follow me to see how to make such a handmade collar necklace at home? This is a video tutorial on making a charming beaded necklace with rhinestone heart drops for Valentine's Day. Hope you enjoy watching it! 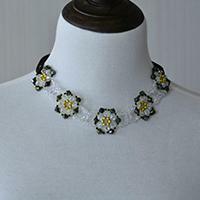 This is a detailed tutorial on making a beaded flower statement necklace with ribbon strand. You will learn beading skill after finish this DIY project. 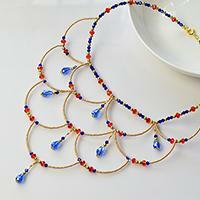 Do you like bead choker necklace? 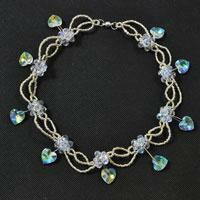 This Pandahall tutorial is about making a tube bead and peal bead choker necklace. Hope you like it. 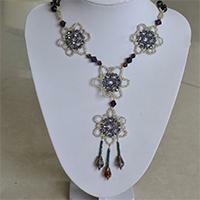 This article tutors a purple beaded big pendent necklace making process. It may take a while to finish it. Below is the detailed steps. How to make jewelry with wire wrapping techniques? 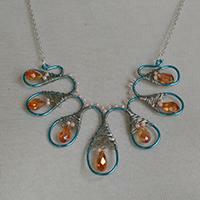 This article will show you how to DIY a statement necklace with blue wire and orange beads. Do you like flower choker necklace? In this simple Pandahall tutorial, I’ll show you how to DIY a flower choker necklace step by step. 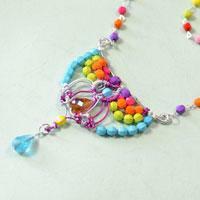 Do you love make seed bead necklace? 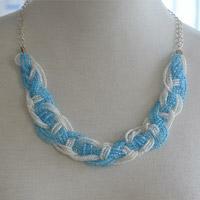 This article will show you how to make a blue braided seed bead necklace at home.